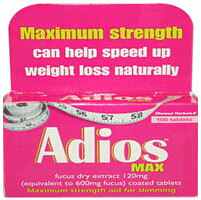 Adios Max is a completely natural and herbal slimming tablet and is a higher or maximum strength version of the original Adios product. Adios as a brand has been available to buy over the counter for many years and is one of the most familiar and widely sold slimming products in the UK. The Max version of Adios has a slightly higher price tag than the original and packaged differently in a bright red box compared to the traditional blue and green. Cosmetics and dosage apart there are not too many differences. 120mg of dry concentrated Fucus extract is contained in the formula which is equivalent of 600mg fucus. Fucus is type of sea weed- Fucus vesiculosus, or ‘bladderwrack’ to give it its proper name, is the typical brown or green seaweed commonly found on beaches all over the world. Fucus has been used as a dietary supplement for centuries spanning civilisations, as it was believed to have a beneficial effect on the heart and liver. Other ingredients include: Dandelion root, boldo and butternut. As a precautionary measure It is advised to refrain from taking under the following circumstances. It is targeted towards the cheaper end of the market with the original product slightly cheaper – both products can be purchased for under £10. Cheap does not neccessarily equate to effective – unfortunately Adios is not the most of potent of slimming products. It will neither kill nor cure and may be worth a purchase but dont expect the results than can experienced by some of the premier weight loss product currently on the market. Purchases can made at many high street stores in the UK including the likes of Superdrug, Boots and many supermarket chains. 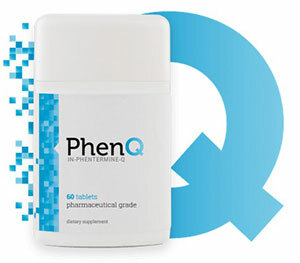 We recommend PhenQ – a multi approach non prescription diet pill that not only act as a fat burner but also block fat and suppress appetite.